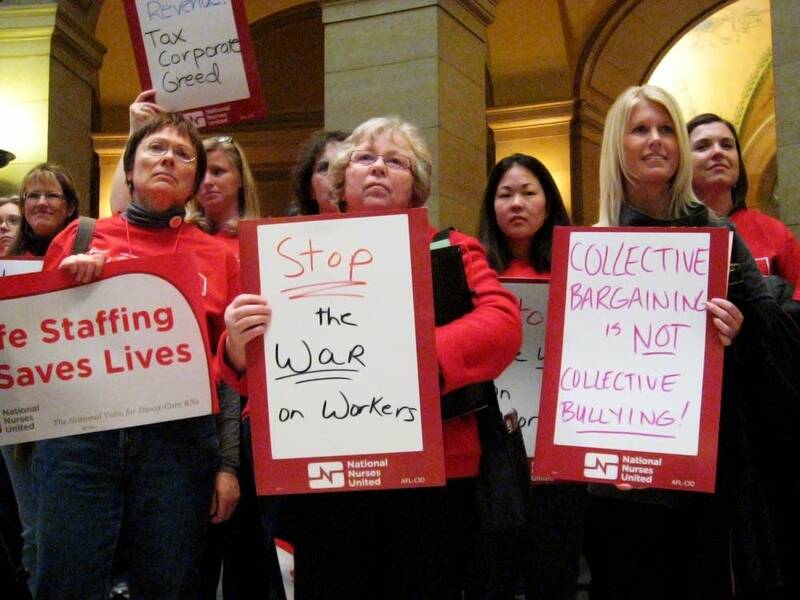 Hundreds of Minnesota nurses rallied at the State Capitol Tuesday to draw attention to nursing and the latest anti-union developments out of Wisconsin. Wisconsin Gov. Scott Walker has stirred a national debate by proposing the elimination of most collective bargaining rights for most Wisconsin public employees. Linda Hamilton, president of the Minnesota Nurses Association, warned Minnesota nurses that Walker's idea is already spreading across the border. "Wisconsin may be at the top of the news today, but what's going on there is not an isolated event," she said. "What's happening there is happening here. We have bills being introduced here in the Minnesota Legislature to limit the power of our union." Hamilton said there is already a proposal in the Minnesota Legislature that would allow licensed practical nurses (LPNs) and paramedics to perform some duties that are currently performed by registered nurses. "I've been to Madison and I carry back with me a message from thousands of other concerned, middle-classed, working people," she said. "This corporate machine must be stopped or it will take us down." Tens of thousands of union-backers have protested in Madison for more than two weeks. Minnesota Nurses Association nurses have already made one trip to join the protests. They will be making return trips on Thursday and Saturday.